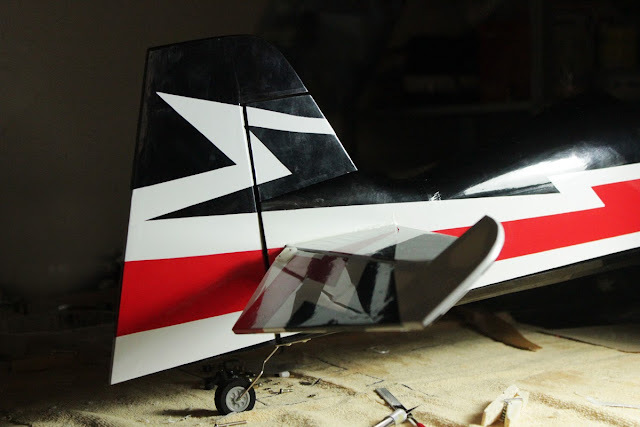 After completing the wing, an incredibly straight forward phase, where everything fit in place with little to no modification, I started working on the tail. A whole new level of challenges were waiting for me, and the first flaws of the kit showed themselves! Nothing impossible though, also what can you expect for the price?! First thing I did was to give some consistency to the underneath appearance, so I peeled off the cover from the two tail feathers and recovered them as I did last time with the wings. After that I glued the fixed part of the stab to the fuse, making sure it was centered and aligned. To do so I wanted to experiment a technique I found on internet, which consists in mixing some paint to the epoxy glue. I used white for the upper part and black for the bottom. It worked great, and this way the glue will not get yellow over time. An important step here to remember is to insert the link between the two tail feathers before glueing the stab in position, otherwise it will be impossible to do so afterwards. 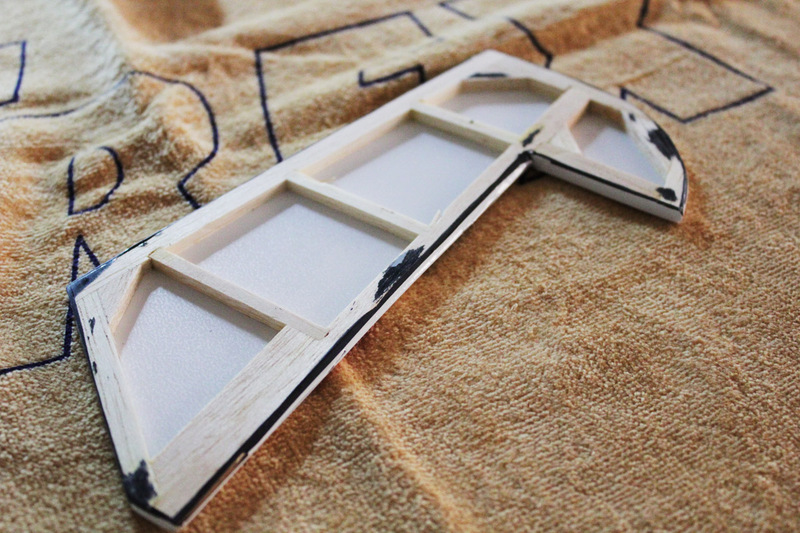 I glued the CA hinges and then the control surfaces. Like I did for the wings I added a bit of black tape to eliminate the gap between the fixed part and the moving surface, which would create flutter. Tail feather peeled off to be re-covered with the same scheme as the wings. 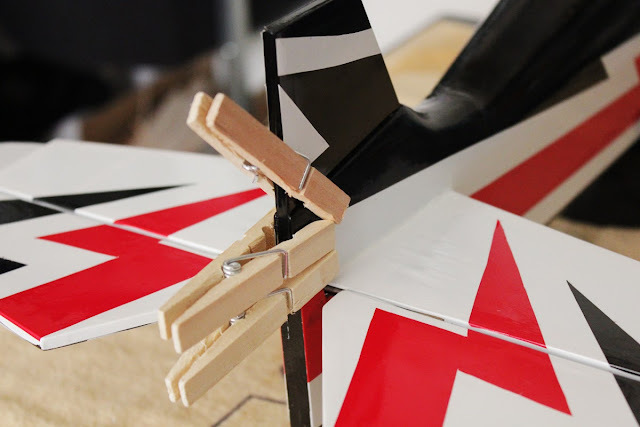 Construction is full balsa, extremely light. 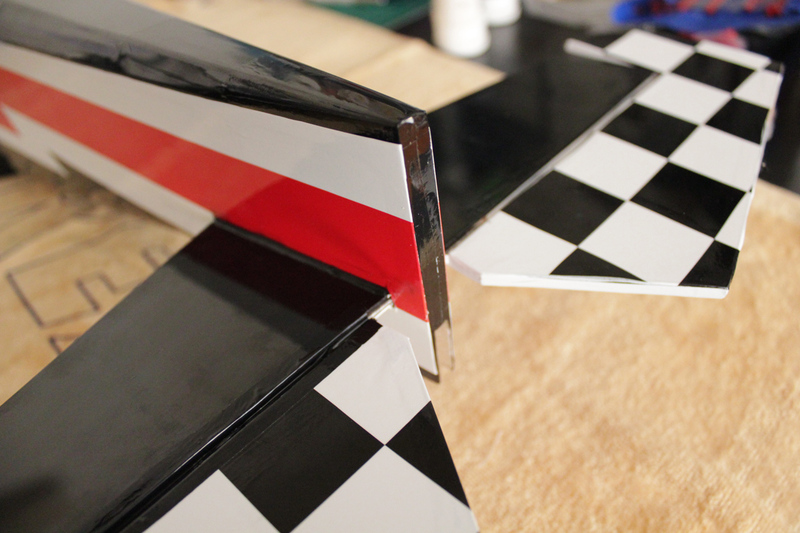 Horizontal stabilisator installed, here you can see the white epoxy to join it to the fuselage. Again, to avoid flutter, tape has been added to the joint. Here you can also see the black epoxy underneath the stabilisator. After that was done I glued the vertical stab in position, using some pegs to help me out with that. Being a fully aerobatic plane the control surfaces are way bigger than the fixed part, and way, WAY bigger than any control surface I ever encountered before. Actually this is my first serious aerobatic plane. We'll see how it goes..
Once the surfaces were glued in I glued and screwed in the tail wheel support and bracket, filing a little groove underneath the rudder. So far so good, it looks like an easy win! Tail feathers in position, time to glue the vertical stab. The fixed part is tiny! 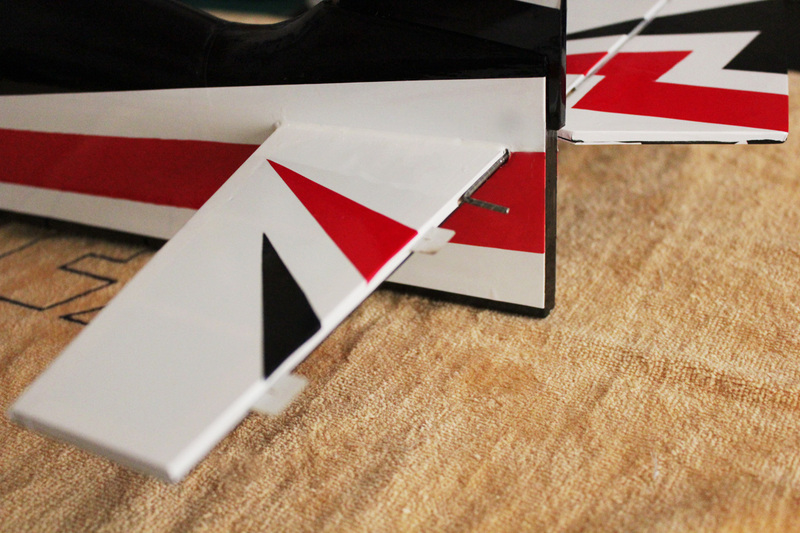 After all the surfaces are mounted I made a groove underneath the rudder and installed the tail wheel. It seems very sturdy, but we'll see how it will keep up with my "landings". First required mods are due to fit the servos i picked. One is a bit oversized, but the other is the one recommended in the (terrible) instruction sheet. Still it did not fit. With the help of a dremel tool I enlarged the housing of the servo and finished the work off with a little file until I had enough space to comfortably insert the servo. An issue I encountered was that the linkages guides are glued in such a position that the linkages are too far and too low from the servos horns, so with the help of a rounded file I had to create two new holes to modify their position. I could not get them high enough without compromising rigidity so I had to flip the linkage stoppers on the servos, which makes it pretty hard to adjust their position. The rudder servo is the one recommended, but the housing is way too big and the servo would fall through, so I had to epoxy in a set of supports tailored for the servo. Having decided to go for a bigger servo for the horizontal stab I had to dremel out a bigger housing in order to fit it in. 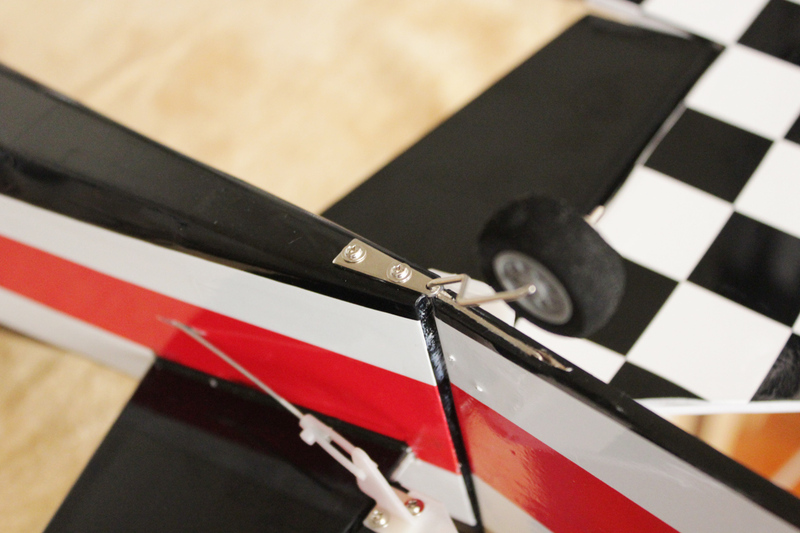 Tail servo is installed, and now it's about to get centered. 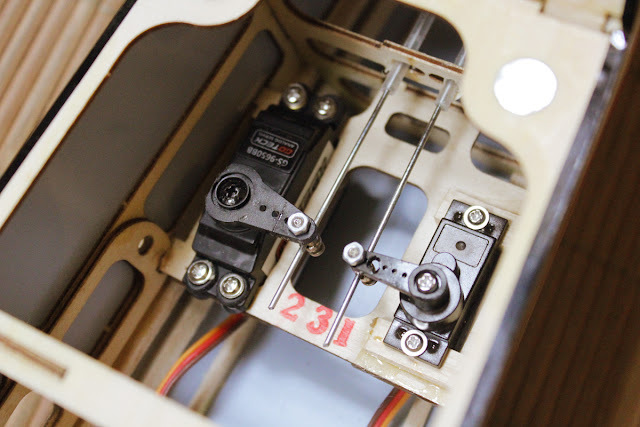 The linkage stopper is upside down because the linkage arrives to the servo way to low and not close enough. 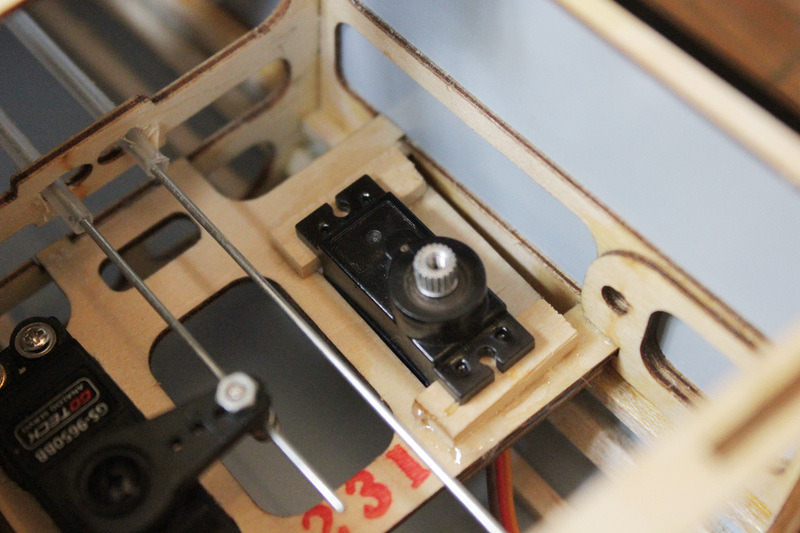 I had to re-drill the holes to allow the linkage to reach the servo. 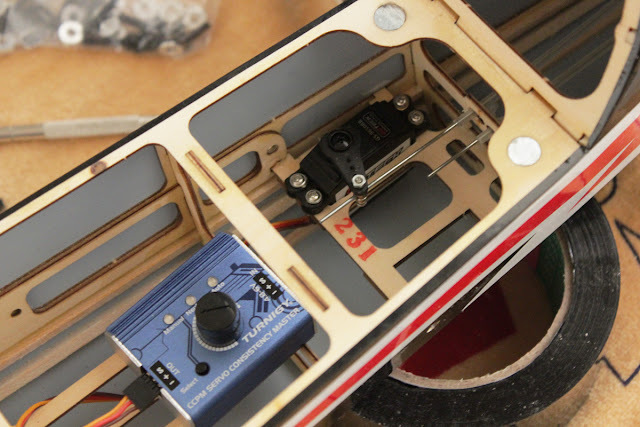 If the first servo was too big, a standard 9g servo (as specified in the instructions) is too small. I had to epoxy a new set of supports. 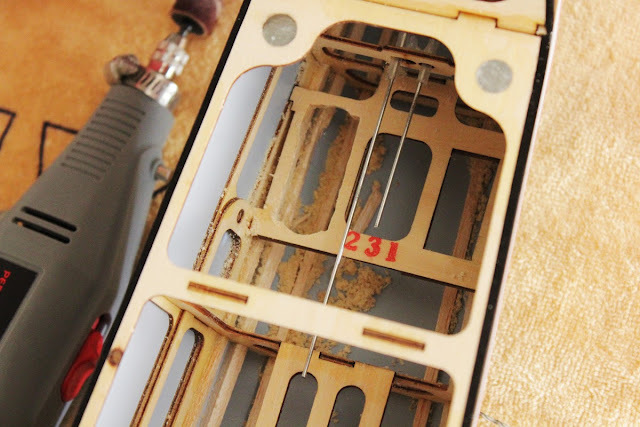 Here you can also see the extended holes for the linkages. Both servos are in. Both linkage stoppers upside down. Not very happy about that. All in all I found this part a bit fiddly, but doable. There is some binding in the movements, but the high torque servos are overcoming this nicely, making for a smooth and precise movement. At 100% travel the surfaces move A LOT! I will have to dial in some serious expo and use my dual rates wisely! Now, let's move onto the motor mount, the landing gear and let's maiden this baby!